Colonel Donnette Boyd, (left) 86th Airlift Wing wing chaplain, and Senior Master Sgt. 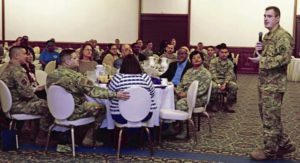 Braderick Adams, (right) 86th AW religious affairs superintendent, present Senior Master Sgt. 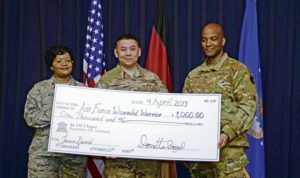 Jason David, 86th AW Public Affairs senior enlisted advisor, with a donation check to the Air Force Wounded Warrior Foundation during the National Prayer Breakfast held at the Ramstein Officers’ Club on Ramstein Air Base, April 4, 2019. 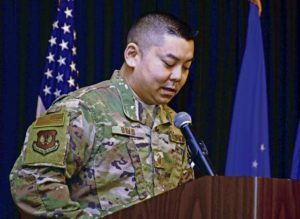 David is a Purple Heart recipient for actions taken during combat and he shared his story with attendees.